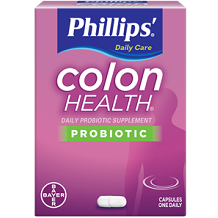 The following is our review of Phillips’ Colon Health Probiotic Capsules. This product claims to have 3 types of probiotics that help fight occasional constipation, bloating, diarrhea and gas. It claims that when taken daily, they can help replenish the good bacteria in your colon and support digestive and immune health. Bifidobacterium Bifidum is said to help with constipation, certain types of diarrhea as well as infection by Helicobacter pylori. Bifidobacterium Longum is said to boost immunity, combat infection, improve gut microbiota, reduce intestinal inflammation and is said to be good for liver health. Other ingredients inside this product include potato starch, gelatin and silicon. Phillips’ Colon Health Probiotic Capsules recommend you take one capsule daily with a meal. It does not state whether it should be taken in the morning, noon or evening. When taken regularly, on an everyday basis, this product can support digestive and immune health by helping to maintain the balance of beneficial and non-beneficial bacteria in your digestive tract. This can help with occasional digestive issues such as constipation, diarrhea and bloating. If you are a diabetic, pregnant, nursing or on other medications, you must consult with a physician before use of this product. Lactobacillus Gasseri as well as other probiotics may cause gas and bloating. There is also a big concern that taking probiotics in combination with immunosuppressive drugs may be exceptionally harmful to your health. This product comes with 4 different buying options for 15,30, 45 and 60 capsules. The 15 capsules option goes for $7.49. You can purchase the 30 capsules option at $10.17 per bottle. The 45 capsules option is $16.95 and the 60 capsules option is $16.97. The product seems to be well priced and you can purchase all online. However, we did notice that there were no specials or discounts given for bulk purchases. The only discount available is a coupon of $1. This product is also found in certain drugstores in the U.S.
We found that the only sort of guarantee is a 3-week money back guarantee. We found this to be an exceptionally weak offer to the consumer as it can take time depending on the individual person for certain products to work. 3 weeks is not long enough and indicates that the product is not very confident in its efficiency. We found that this product contains certain important probiotics for gut health. The pricing also seems good. On the down side the very short guarantee makes us ponder as to why invest in a product which gives you the option of only 21 days to make your mind up whether it works or not. 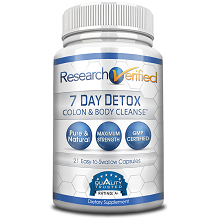 For that reason we do not place this product high amongst our recommendations of colon health products.